The prison system in South Korea has begun using the world’s first robot prison guard, and, according to the Asian Forum of Corrections’, it’s the future of prison security. The robot was developed in South Korea and is currently undergoing its first field trial. 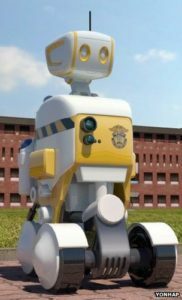 Equipped with 3D cameras and software designed to study human behavior, the robot is able to detect abnormal prisoner activity and report back to its controllers. An officer can also use the robot’s two way wireless system to communicate with a prisoner without having to leave the control room. The robot has been designed to patrol a prison autonomously, but an IPad will allow manual control as well. The next step, say designers, is a robot that conducts body searches although they admit, neither the technology nor the prison system is quite ready for a step that far into the future. 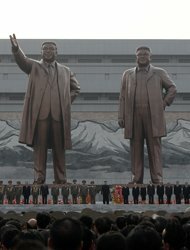 North Korea’s heralded long-range rocket test ended in failure Friday, disintegrating in mid-air soon after blast-off and plunging into the sea in a major embarrassment for the reclusive state. The defiant launch drew condemnation from world leaders who described it as a “provocative” act that threatened regional security, despite Pyongyang insisting it was intended to put a satellite into orbit for peaceful purposes. Some four hours after the rocket exploded over the Yellow Sea, the North admitted the satellite had failed to enter orbit, and that “scientists, technicians and experts are now looking into the cause of the failure”. The United States and its allies slammed the exercise as a disguised ballistic missile test that contravened United Nations resolutions triggered by Pyongyang’s two nuclear tests. “North Korea is only further isolating itself by engaging in provocative acts, and is wasting its money on weapons and propaganda displays while the North Korean people go hungry,” White House spokesman Jay Carney said. He said the launch “violates international law and contravenes its own recent commitments,” under which Pyongyang had agreed to suspend its nuclear and missile tests in return for US food aid. The South said it was keeping a close eye on the North “for further provocative acts such as missile tests and a nuclear test” as analysts said the humiliation could spur Pyongyang to hold a third atomic test. The European Union joined governments in Japan and South Korea in condemning Friday’s move as a provocation that undermined peace and security in the volatile Korean peninsula and the wider region. The North’s sole major ally, China, was more muted in its reaction, calling for restraint from all sides and saying it had not been given advance warning of the launch. North Korea had insisted the launch would not be a banned missile test and that it had every right to send the satellite up, to mark Sunday’s centenary. The North, which is believed to have enough plutonium for six to eight bombs, tested atomic weapons in October 2006 and May 2009. Both were held one to three months after missile tests. COPENHAGEN – Arnold Maersk Mc-Kinney Moeller, the Dane who created the global shipping and oil conglomerate A.P. Moller-Maersk A/S, died Monday at the age of 98, his company said. The shy Mc-Kinney Moeller, who was listed on Forbes magazine’s annual billionaire’s list, turned two small shipping companies that his father had created into a global corporate giant with 108,000 workers across 130 countries. The Moeller-Maersk group owns the world’s biggest publicly-held container shipping group, Maersk Sealand. Maersk Mc-Kinney Moller died yesterday in the Danish capital of Copenhagen. Mc-Kinney Moeller stepped down as board chairman in 2003, at the age of 90. Five months earlier, he steered the two companies that formed the nucleus of the A.P. Moeller group through a merger, creating the current A.P. Moller-Maersk A/S. In high spirits but visibly frail, Mc-Kinney Moeller made his last public appearance Thursday at the group’s general assembly in Copenhagen. “We sisters have lost a father who never betrayed either his family or his work,” Ane Maersk Mc-Kinney Uggla said on behalf of the three daughters. b) Watch the video under “Resources” below. Do you think this would be a good idea for U.S. prisons? List 2-3 pros and cons of using robots in prisons. Explain your answer. b) How do the U.S. and our allies view North Korea’s rocket test? Be specific. b) What type of company is Moller-Maersk? c) What is significant about the Moeller-Maersk group? d) How did Mr. Mc-Kinney Moeller build the business from his father?